I absolutely love sweaters and stripes and When I see the two combined there's no way I can resist! My roommate constantly teases me for having too many stripes in my closet. In my opinion you can never have too many stripes! 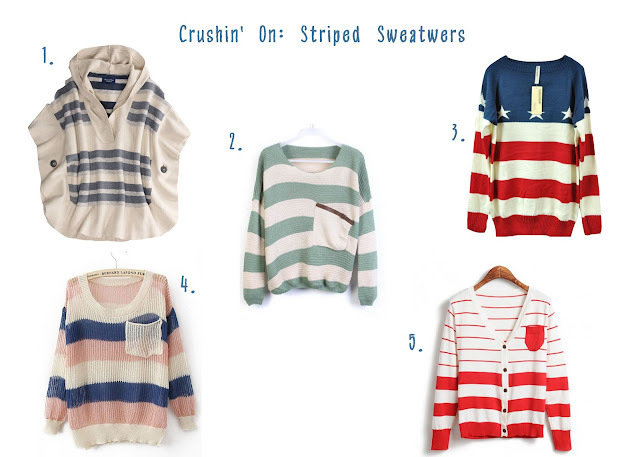 There are some of the cutest sweater/stripe combos I've found on one of my favorite fashion sites Wanelo. Link up and join the Current Crush Party! Found you via Framed Frosting and so glad I did! I couldn't agree more on the striped sweaters, they all look so cozy. I also think there is no such thing as too many stripes! ahhh the deal in the middle is my dream lazy day with leggings sweater! Cute collection! Thanks for joining us for the CHQ blog hop - we loved having you and hope to see you again next week! in love with the mint one! love striped sweaters! i absolutely love striped sweaters! the fourth one looks particularly cozy! I love striped sweaters too!! I only have a few, but they are SO fun!! #4 on this pic is my fav of the group!